Overhead welding requires welders to remain in an odd position throughout the process – which often leads to intense wrist and shoulder fatigue. For every welder, it’s likely that they’ll come across a situation when they need to weld two surfaces while cranking their head up. This is basically the essence of overhead welding, and the positioning and heavy weight of the weld gun makes it difficult to practice. Considering the challenging nature of overhead welding, it’s not just beginner-level welders who have difficulty in mastering it; even experienced welders have trouble in fashioning a good weld while out of position. Click or Tap below to get your free book on mastering MIG welding, and several other FREE gifts! 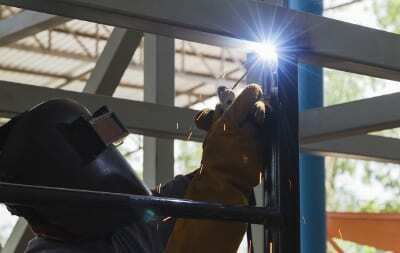 There are numerous concerns that any welder has to consider, such as managing awkward positions and safety issues, when tasked with overhead welding. 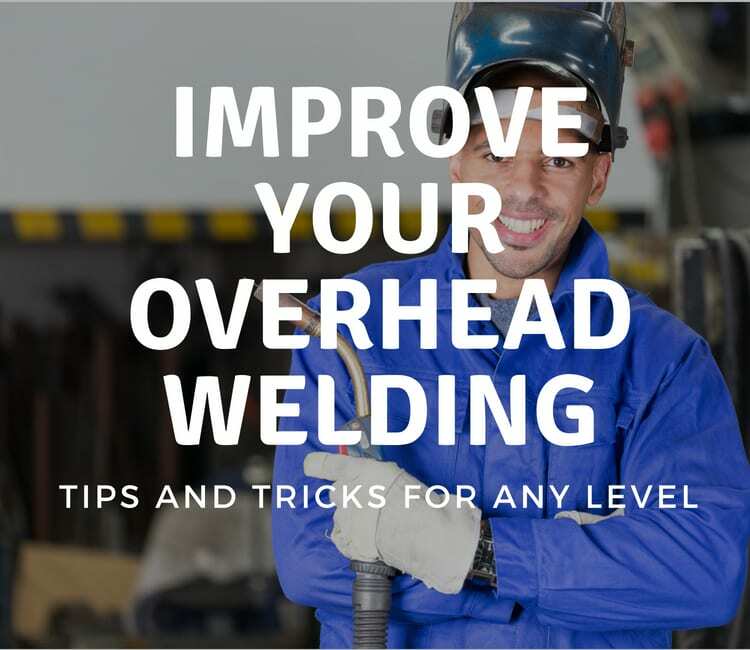 Usually carried out on the underside of a welded joint, there are a few tips and experts recommend remembering while doing an overhead welding job. The nature of overhead welding is such that it makes it difficult to implement without getting burnt by molten slag one’s face and eyes. Not thinking about using a helmet means taking the risk, which no expert welder recommends. While you’re welding a joint overhead, it isn’t like gravity will be so kind as to stop pulling down on things; it’ll still act upon the earth with the same force. Hence, experts recommend using the right helmet, one that can withstand the force of hot, molten metal. Make sure that the helmet generously covers your eyes and the most of your face. Also, your hair is also likely to suffer damage due to molten slag during the overhead welding process, so make sure to use fire-resistant hair gel while welding. Next, you’ll need your arms to be well-protected against the heat and dangers of molten slag. Using a plain jacket or working with a shirt will do no good because adequate thickness is crucial. A thicker jacket will take up any damage that occurs as a result of slag falling down. Ideally, you’ll want to take extra care, especially if you’re a beginner at overhead welding. Using earplugs is highly advised because droplets of slag tend to fall inside ears as well, making for a painful experience later on. The surrounding environment and temperature can make it immensely difficult for any welder to practice overhead. In some situations, it’s likely that the surface you’re welding is below your welding gun. This will be beneficial since it allows heat created by melting the filler and making the weld, to rise up into the air. On the other hand, if the metal piece you’re welding is above your welding gun, then the heat created will move further into the weld you created. This will have a detrimental effect on your weld by causing it to cut into the metal surface and making the overall appearance warped more than usual. To avoid having this problem, a simple solution is to lower the amperage, further than the normal settings. If you have the height to reach up and weld together two joints that are otherwise, difficult to reach, don’t do it. Experts discourage going on one’s toes just to create a weld overhead since this can put one out of balance and at the risk of falling over. It is recommended that welders get as close as possible to the metal surface that needs to be welded. This will allow much more comfort than the former suggestion and it also creates a superior weld. It’ll mean that you have to use some extra ladders and even an extension cord but implementing this small change can make all the difference in how convenient it is to practice overhead welding. 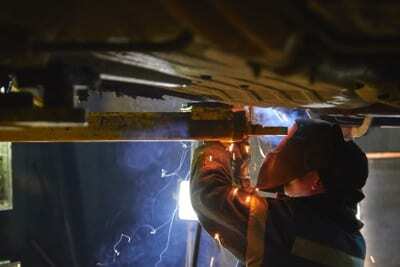 An integral part of one’s body position while overhead shielded metal arc welding is operating the electrode and keeping the torch at a good angle. A common piece of advice that experts give to beginners is that practicing shielded metal arc welding overhead is similar to doing it in any other position, except it’s upside down. This means that whatever motions you choose to use with a flat bead, you can use them with an overhead one as well. With overhead welding, you can’t take things slow because gravity is still active and if you take one second longer to lay a bead, it’s likely that the result will be a puddle of molten slag falling down on you. To make sure that you have a better speed of travel while laying a bead overhead, you’ll have to feed the wire fast enough. However, make sure to do so fast enough that it maintains your speed of travel’ any faster and you’ll only make more of a splatter, which can ruin your weld and clog the nozzle of your welding gun. You may have to experiment with the settings on your welding equipment to find an adjustment that allows for fast enough wire feeding. While welding in an overhead position, most welders need to lower the amperage to control the heat. Likewise, the voltage on equipment must also be managed in order to maneuver the arc length. Managing your arc length is similar to adjusting your equipment’s wire feed settings; it helps to create a durable weld and reduces splatter. By reducing the voltage, you can make the arc length shorter, retain a smaller puddle and make it easier to work on without chances of creating splatter. In overhead welding, a higher speed of travel means you end up with a smaller bead of weld than you’re used to. To compensate for this, experts recommend that the small bead is carried in circular motions so a tighter weld is made. Another way to make a stronger weld despite using a smaller bead is to make more than one pass. Seasoned welders recommend making multiple passes on a single weld to strengthen it better. These are all the useful tips one should remember while welding overhead. Not only do these cover up many rookie mistakes but these can also help one become an expert at making strong overhead welds. Is pipeline welding the right career choice for you?